McAllen High's Westyn Henderson breaks free on her way to scoring the game-winning goal against San Antonio Johnson during the second half of their Class 6A regional semi-final match Friday, April 13, 2018, at Blossom Athletic Center in San Antonio. McAllen High won the match 2-1. SAN ANTONIO — Westyn Henderson was a mine of chances for McAllen High, and with 15:35 remaining in her team’s fourth-round game against San Antonio Johnson, she struck gold and sent the Bulldogs to their first regional final since 2007. 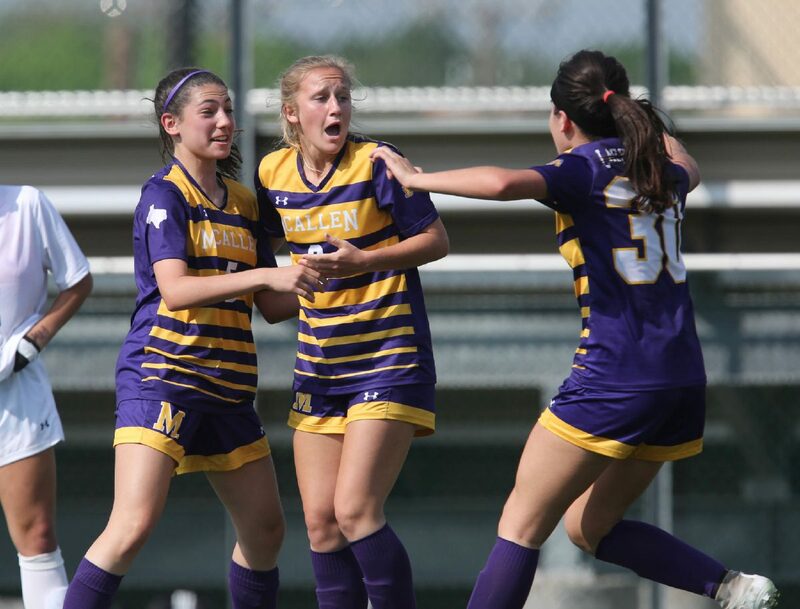 The 2-1 win on Friday at Blossom Athletic Center puts McAllen High into the Class 6A regional final against Austin Lake Travis at 1 p.m. Saturday. On the winning goal, Henderson received the ball in open space, entered the penalty box centered to the net and then dribbled toward the right edge. 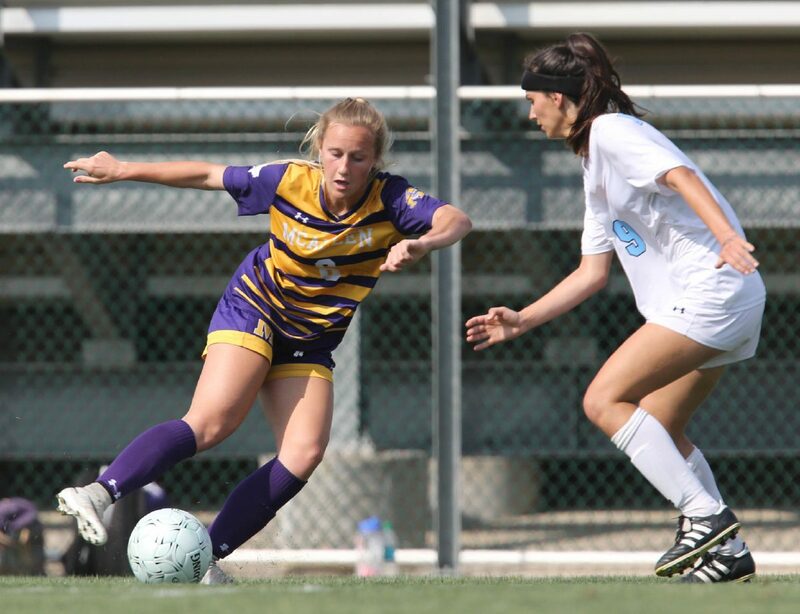 She used multiple cutbacks to shake her defender, then turned and shot the ball past Jaguars goalkeeper Brooke Burgess. 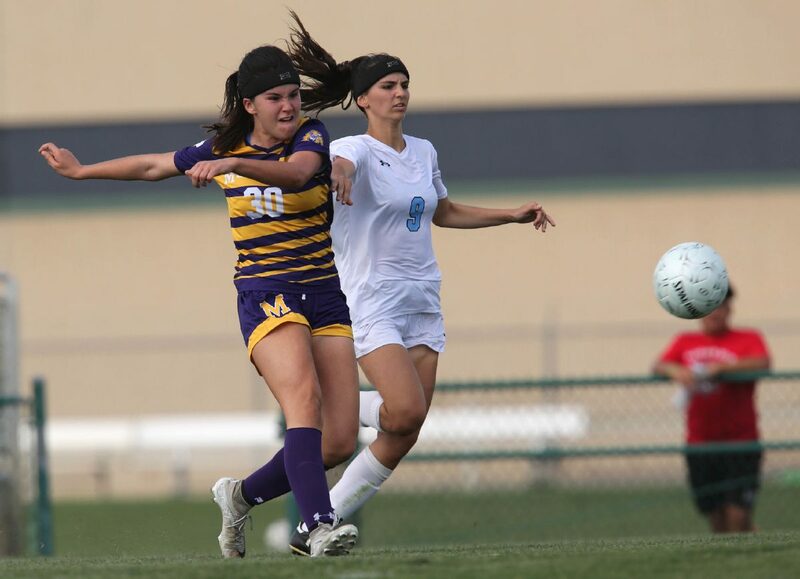 The remaining time on the clock produced many tense moments for McHi, which has won three consecutive District 30-6A titles. McAllen High's Jackelyn Lemus and San Antonio Johnson's Talin Rio battle for the ball during the first half of their Class 6A regional semi-final match Friday, April 13, 2018, at Blossom Athletic Center in San Antonio. McAllen High won the match 2-1. 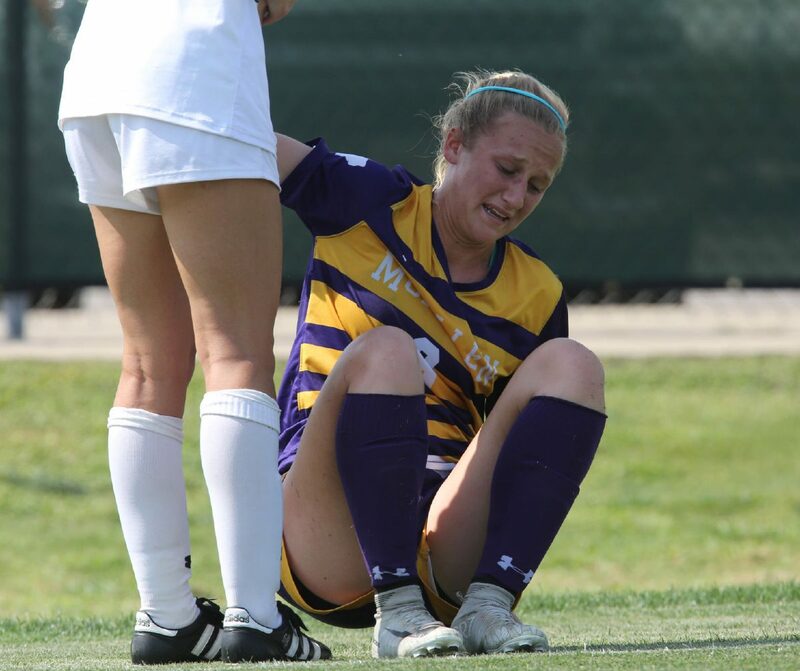 McAllen High's Westyn Henderson is helped up after hurting her shoulder while playing San Antonio Johnson during the first half of their Class 6A regional semi-final match Friday, April 13, 2018, at Blossom Athletic Center in San Antonio. McAllen High won the match 2-1. 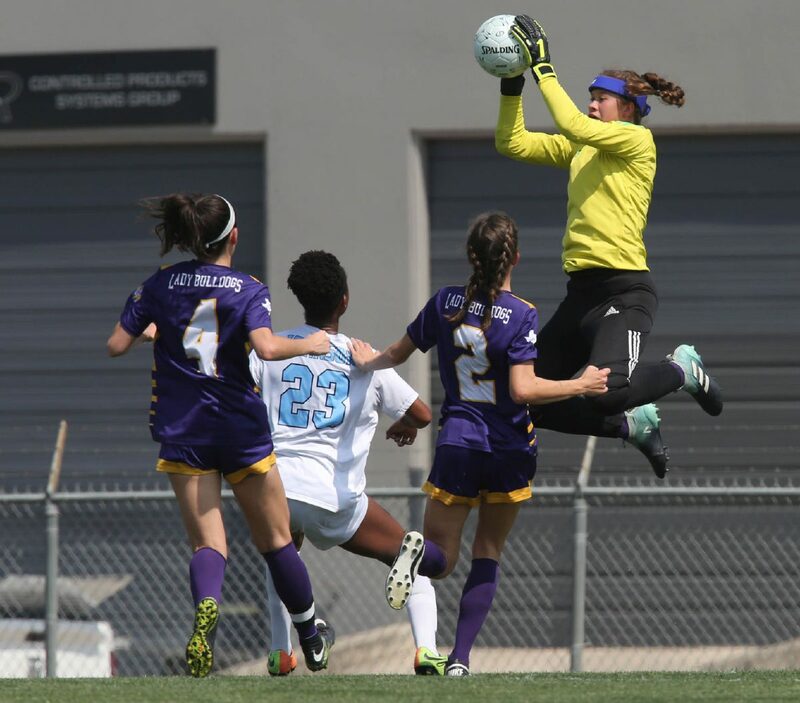 McAllen High goaltender Lexi Gonzalez makes a save on a San Antonio Johnson shot during the first half of their Class 6A regional semi-final match Friday, April 13, 2018, at Blossom Athletic Center in San Antonio. McAllen High won the match 2-1. McAllen High's Hannah Kelly moves the ball as San Antonio Johnson's Ashley Stamps defends during the first half of their Class 6A regional semi-final match Friday, April 13, 2018, at Blossom Athletic Center in San Antonio. McAllen High won the match 2-1. McAllen High's Ava Alaniz tries to move the ball past San Antonio Johnson's Valerie Endres during the first half of their Class 6A regional semi-final match Friday, April 13, 2018, at Blossom Athletic Center in San Antonio. McAllen High won the match 2-1. McAllen High's Ava Alaniz shoots the ball as San Antonio Johnson's Valerie Endres defends during the second half of their Class 6A regional semi-final match Friday, April 13, 2018, at Blossom Athletic Center in San Antonio. McAllen High won the match 2-1. McAllen High's Jackelyn Lemus is pushed off the ball by San Antonio Johnson's Ashley Stamps during the first half of their Class 6A regional semi-final match Friday, April 13, 2018, at Blossom Athletic Center in San Antonio. McAllen High won the match 2-1. 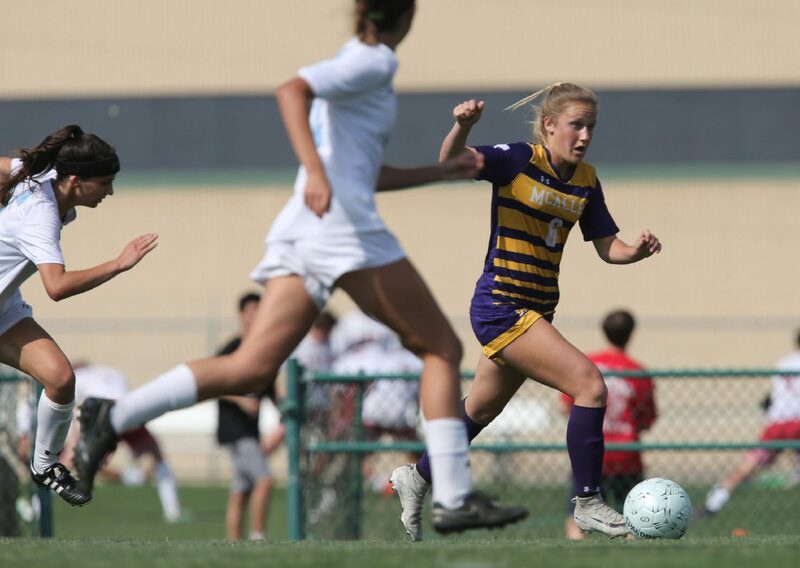 McAllen High's Westyn Henderson moves the ball past San Antonio Johnson's Valerie Endres during the second half of their Class 6A regional semi-final match Friday, April 13, 2018, at Blossom Athletic Center in San Antonio. McAllen High won the match 2-1. Sophomore keeper Lexi Gonzalez continued to play large in net to preserve the lead, including a parry on a shot from Johnson midfielder Ashley Stamps. 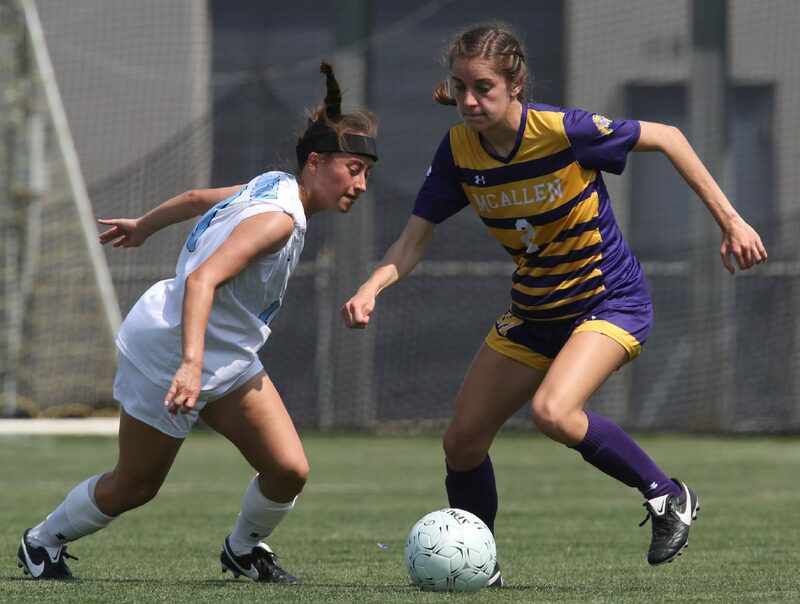 The Bulldogs kept possession for a majority of the last six minutes of the game, holding the ball near the corner flag and thwarting any forward attack from the Jaguars. 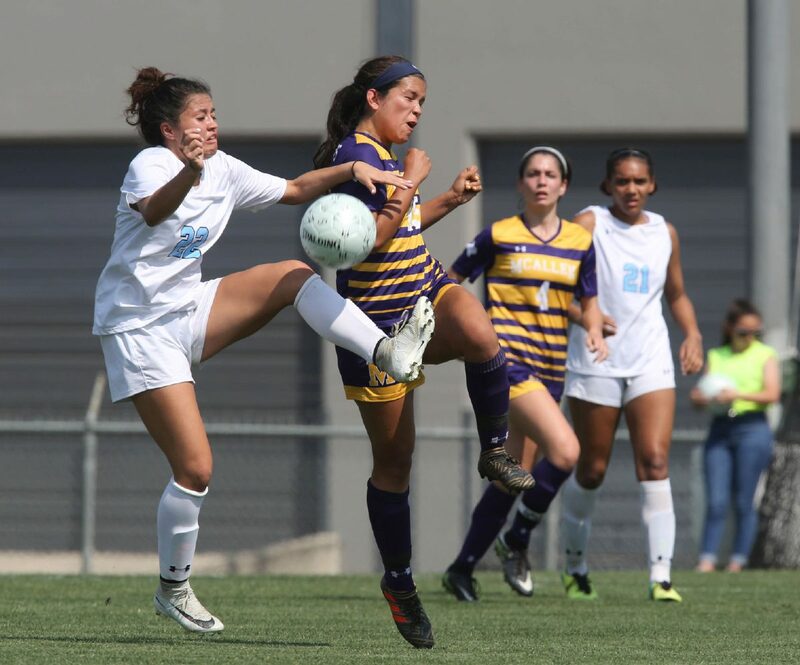 From opening kick in the regional semifinal, McAllen High was the aggressor against San Antonio Johnson. Halfway through the first period, the Bulldogs took a lead. 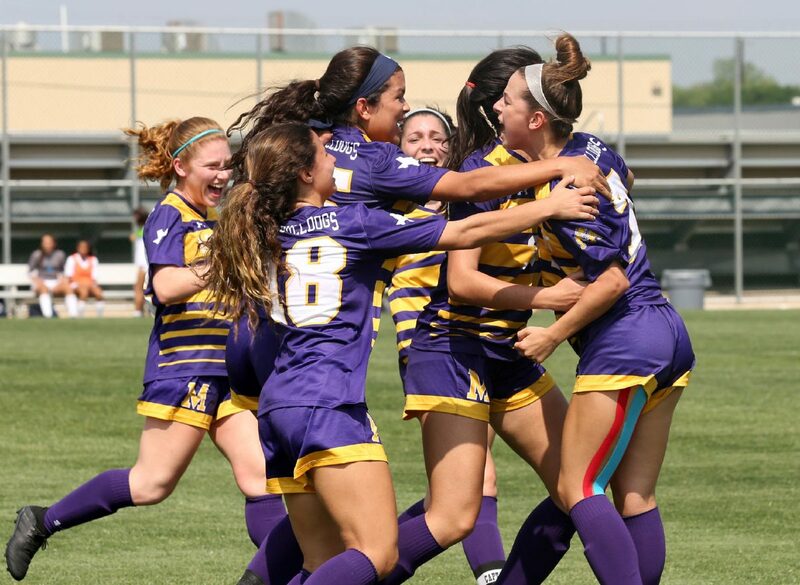 The opening goal came on McHi’s second corner kick in quick succession. Zoe Flores sent the ball directly to the near post. 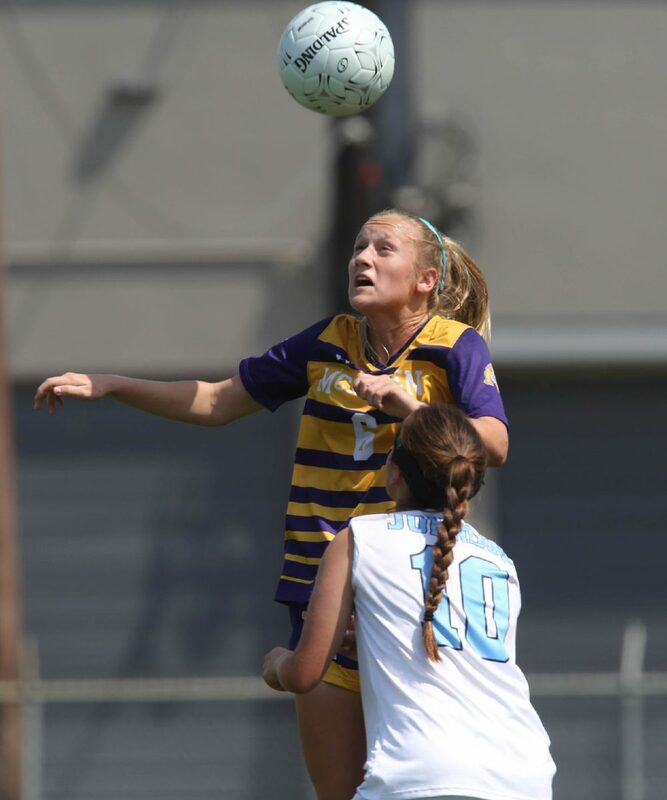 When Johnson defender Brooke Stevens tried to clear the ball out of danger, her attempt had the opposite effect and deflected behind her own keeper. Though not a conventional way to take the lead, the score did wonders for the team’s morale, Gonzalez said. Despite keeping possession for most of the half, the Bulldogs only scored once in the first 40 minutes. Just minutes into the second frame, Johnson’s Kaelyn Carnahan made the Bulldogs defense pay for one of its rare mistakes. She intercepted a ball in front of the net and leveled the score. Before Henderson’s winning goal, the Bulldogs were pressing. Ava Alaniz received a stellar through ball from Chloe Fallek, but Burgess saved the one-on-one opportunity. 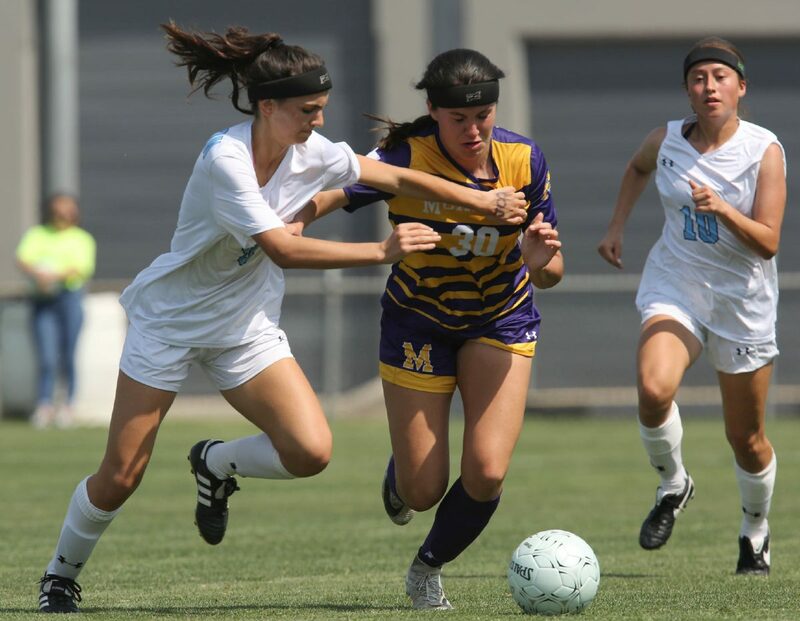 McHi defenders Rylie Flores and Victoria Sola on the interior and Andrea Soto and Hannah Kelly were given the enormous task of keeping the Johnson attackers from running free. Bulldogs coach Patrick Arney was complimentary of his back line, though the group needed substitution in the humidity. Gonzalez was also grateful for the players in front of her keeping the chances low. 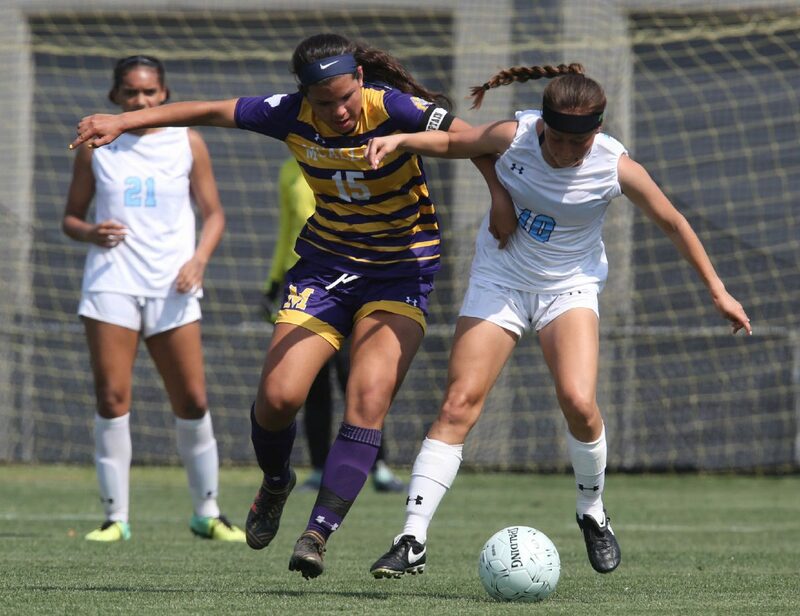 McAllen High will try to reach its first state tournament against Lake Travis, which shut out Brownsville Rivera 5-0 on Friday.